Paradox Obscur’s debut self-titled album is now available for pre-order on Peripheral Minimal, presented in a jewelcase CD and limited to just 200 copies, with artwork by Frantz Schlusselhuber. 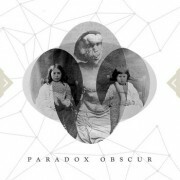 Paradox Obscur hail from Rhodes and feature members, ‘Kriistal Ann’ and ‘Toxic Razor’, they pride themselves, “on using exclusively, real hardware synthesizers & drum machines”. Soundwise they create unique Minimal Synth and Coldwave that can be compared to fellow Greek acts, ‘Selofan’ and ‘Human Puppets’, drawing on melancholic synthscapes and early eighties Coldwave.